TreeSteward asistng in selecting the right tree for their yard. 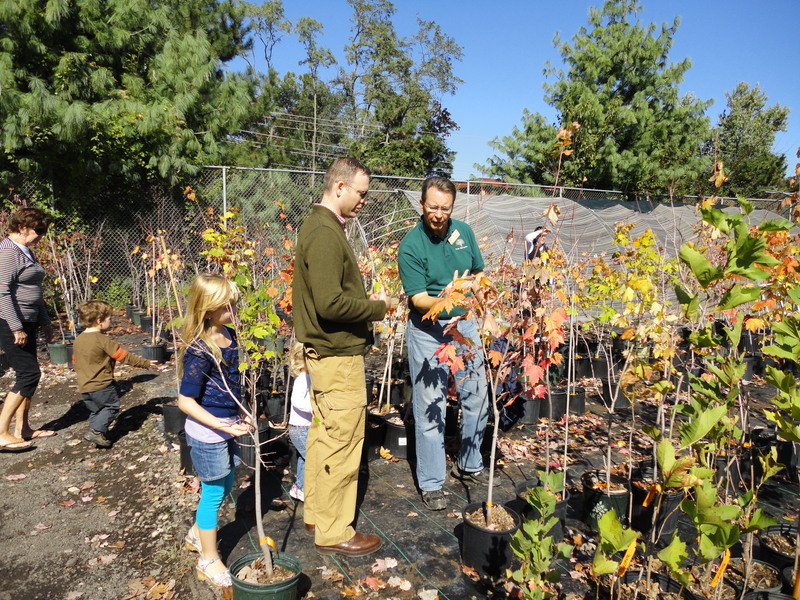 Last fall during Arlington County’s free Tree Distribution day, TreeStewards helped families select the best tree for their yard and provided education on its care. The event is happening again on October 26, and our members are even more involved! We helped find and select the best available tree species for Arlington yards by visiting possible vendors. 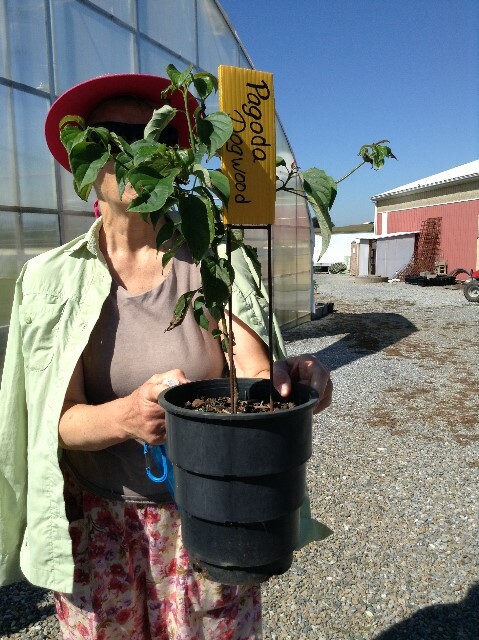 This lovely Pagoda dogwood is better than a licorice stick! Octoraro Nursery in Kirkwood, Pennsylvania was worth the long drive. The nursery specializes in all native tree species for reforestation projects and wetland habitats. It’s small with only a few staff, one barn, and fields of trees in all sizes. Their Betula lenta, aka sweet birch is similar to our river birch but has one main stem and a darker bark; we really liked the way that and the Pagoda dogwood looked. Earth Sangha nursery depends on dedicated volunteers. Nearby Earth Sangha in Fairfax County was inspiring. This nonprofit collects, cleans, and plants seeds from local native plants (often endangered by development) and then uses them to increase native diversity in parks and rehabilitation sites. It’s a shoestring operation depending on volunteers who love nature and we were impressed by the oaks, hickories, walnuts and even butternut trees – all started from the seed inside the nuts. 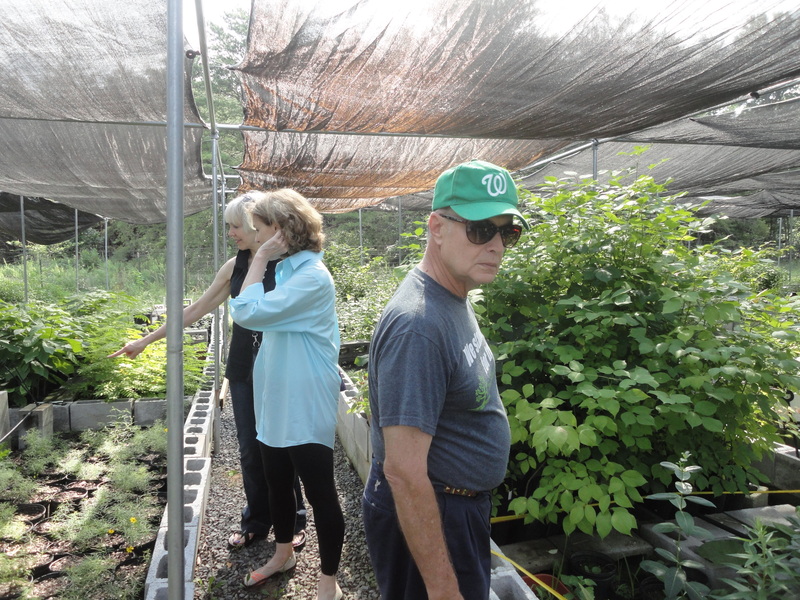 Abby Farms Nursery in nearby Indian Head, Maryland was a good example of large scale nursery production since it is one of the Dennison Nursery companies. They have a wide selection of cultivar trees and some straight native species. The nursery comprises numerous greenhouses, large plantations, mountains of mulch, and lake that recycles irrigation water. Clear Ridge Nursery near Westminster, Maryland took us back to the family farm days. The owner and his family live in a fine old house surrounded by ancient trees, and farther afield are acres of the young tree plantations. Imagine waking up each morning to very happy birds who have a choice of twenty different tree species to eat from. We learned a great deal on how trees are grown, and how to judge quality of the young trees. But really, it was like being asked to help Santa by choosing the best in a candy store. This entry was posted in Community Service, Events and tagged Arlington, education. Bookmark the permalink.